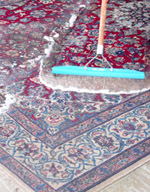 Mighty Clean Carpet Care offers in plant oriental rug and specialty area rug cleaning. Proper fiber identification is the key to cleaning these often delicate rugs. Our expert staff will identify the fiber type to determine the best way to clean your rug and to ensure maximum soil removal. Mighty Clean Carpet Care has handled many of the areas most delicate Oriental, and Turkish rugs of all types of fibers including cotton, wool, and silk, as well as a variety of synthetics rugs, such as fringed, bound synthetics, braided rugs and more. We employ a whole line of cleaning agents and stain removers specially formulated to safely and effectively clean these delicate fibers. First we do a thorough inspection of the rug to determine the fiber type and identify any potential cleaning issues, such as dye bleed or shrinkage. The rug is pH tested to ensure we use the proper cleaning products for the specific rug. Next the rug is dusted to remove dry soil, the typical household rug can hold several pounds of soil even with routine vacuuming. After dusting specific spots and stains like pet urine or odor are pre-treated. Once all the spots have been treated it’s time to give the rug a bath using a special blend of our custom wool safe cleaning agents. Our triple planetary rotary machine ensures a deep thorough scrubbing that is unparalleled by other methods. The area rug is then rinsed with clean water until all contaminants have been removed. By this step any soils that arrived with the rug are long gone. Finally the rug is groomed to lay the pile down and placed in our dry room to speed the drying process.